Ooma Smart Security offers a full suite of home security products dedicated to helping you protect your home. You can shop for sensors and security cameras individually based on your home monitoring needs, or choose one of our starter pack bundles. Home phone and do-it-yourself home security service. 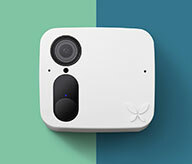 The starter kit includes a Telo and a Motion Sensor. Home phone and do-it-yourself home security service. 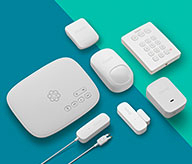 The starter kit includes 1 Motion Sensor, 2 Door/Window Sensors, and 1 Water Sensor. Deter intruders from entering your home with a loud 105-decibel siren. Wall-powered and wireless connectivity. The Ooma 4G adapter provides “always on” connectivity during an internet outage through the nationwide Sprint 4G LTE network. The high-speed connection allows real-time alerts for both routine and emergency events at home.